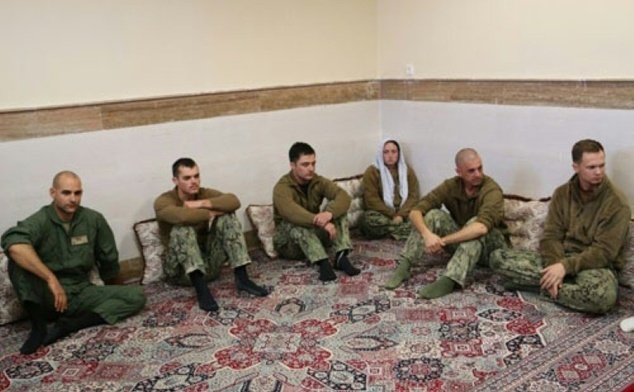 As I look at the photos of the American sailors captured by Iran, many things about the entire incident vie for my attention. 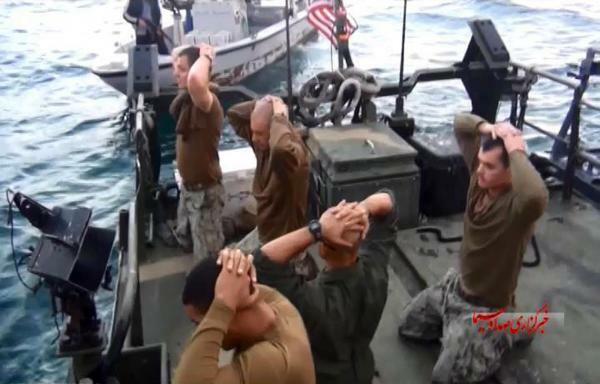 The shameful postures of surrender that the Iranians demanded of our innocent sailors--is, in and of itself, unacceptably shameful. There they are, on their knees, with their hands clasped on or behind their heads. The fact that the Iranians brazenly violated the Geneva Convention which requires Iran to protect prisoners against "insults and public curiosity" is criminal--although again, not surprising, as is their seizure of the American boats' GPS equipment. Iran's demand--what else could it be?--that at least one American sailor "apologize" on video for their "mistake" and thank their Iranian captors for their great hospitality--is disgusting but so useful for the Iranian propaganda mill. It bears no relation to the truth of the matter. The fact that President Obama failed to mention that his sailors were in captivity even as he addressed the nation in his last State of the Union speech--is beyond shameful but alas, is merely more of the same. The fact that Secretary of State John Kerry would have us believe that his conversations with Foreign Minister Mohammad Javad Zarif actually played a significant role in Iran's decision to release the sailors unharmed and quickly--is as shameless as everything else--such as the fact that the American administration has gone along with the pretense that the sailors had either done something "wrong," or that their boat had somehow mis-functioned. Then, there is at least one other thing. Dr. Walid Phares, on Facebook, called my attention to the fact that the single American female sailor in the photos is....wearing hijab. What? Is that regulation American Navy attire for women? Is this American sailor perhaps a religious Muslim? No. Iran is demonstrating that it is prepared to enforce its version of Shariah law, even upon infidels, when it has the power to do so. America, like other Western countries, including Israel, has been busily integrating women into a previously all-male military. Iran will have none of it. Iran will not recognize the sovereignty of foreign vessels, diplomats, journalists, or the military. Formerly sanctioned money is flowing into the country and this has empowered Iran, not to become more open and conciliatory, but rather, to show more of its true barbarian colors. Iran will put women in their place wherever and whenever it can as a way of declaring war upon despised Western customs such as that of gender equality. King Obama is making no principled moves, none at all. Phyllis Chesler is a Shillman-Ginsburg Fellow at the Middle East Forum and recipient of the 2013 National Jewish Book Award. She is the author of sixteen books, including Women and Madness, Woman's Inhumanity to Woman, and The New Anti-Semitism. See her website here.